We packed up out of Stagecoach RV in St Augustine on Tuesday morning and headed a couple of hours north on I-95 to Coastal GA RV Resort in Brunswick, GA for the TRVN rally. It was an easy drive north on I-95. We never even hit any traffic on I-95 through Jacksonville. Our GPS had us routed around Jacksonville on I-295 but we took a chance and stuck it out right through town without any issues at all. Surprise, surprise! Our first stop was the Flying J in Brunswick at exit 29 on I-95. We filled up with diesel for $4.129/gallon and then headed across the street to our campground. All we can say about Coastal GA RV Resort is WOW!!! This place is wonderful! Most of the sites are paved pull through with the perimeter sites being back in sites. We have one of the perimeter sites. Lush green grass and hedges between the sites with a paved patio, picnic table and BBQ stand on every site. Each site also has one of those hybrid pedestals with 30/50 amp plug in, water, cable and a light on top. Free wifi via tengo internet throughout the park. The rally rate for our site is $35.20 which we think is awesome for this hidden gem of an RV resort. 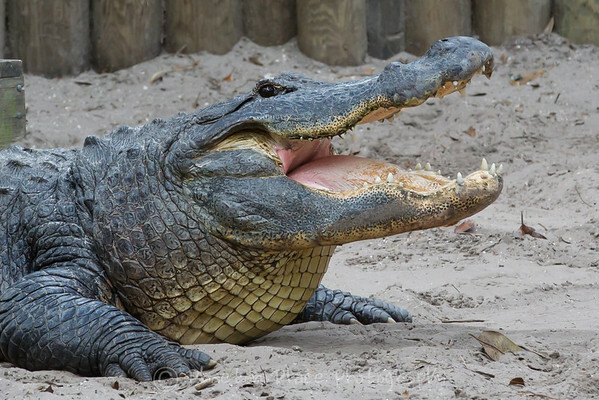 The park is situated a mere 11 miles from St Simon and Jekyll Islands which we hope to check out while in this area. There are over 75 Tiffin motorhomes here for this rally and everyone seems really friendly. Teddy has made a ton of friends at the dog park and would love to go swimming in the small lake at the resort but we are still a little concerned about alligators, so he won’t be swimming anytime soon. He is running himself ragged at the dog park every day. Registration was this afternoon and we had the meet and greet with all sorts of great food this evening. Brannon from Custom RV in Vina, AL is here doing all sorts of mods. We haven’t had a chance to pin him down yet but I’m hoping he remembered to bring a new bedroom ceiling fan and a replacement 4 to 1 HDMI splitter for us. There are a few seminars scheduled for Thursday and Friday with Saturday being a free day for us to explore the area. We were hoping to drive up and take a tour of Savannah, GA while here but the seminars, BBQ and pot luck may force us to rethink our visit. A few deliveries arrived at the park for us yesterday afternoon. We had ordered more Keurig K-cups from Coffee For Less and our new Garmin Desi 560 LMT from Amazon was also waiting for us. So far the 560 LMT looks pretty cool. It is primarily a trucker’s GPS but also has an RV setting that let me program in the dimensions of Phaeton Place and our Vue. In theory, this will help route us more effectively onto major routes and also advise us of any low clearance bridges, just in case we missed one when planning our route. Not sure how effective it will be but I updated our North America maps to the latest version and we hope to give the 560 LMT a good workout on our way back to Canada before the end of this month. I’m a little disappointed we can’t transfer our 2010 United Kingdom maps from our old Nuvi 760 to the Desi 560. Apparently once downloaded, maps are tied to only one GPS unit and therefore not transferable between units. Seems to be more of a money grab by Garmin than anything else. Anyway, it is what it is. Today’s photographs are from our time in St Augustine. 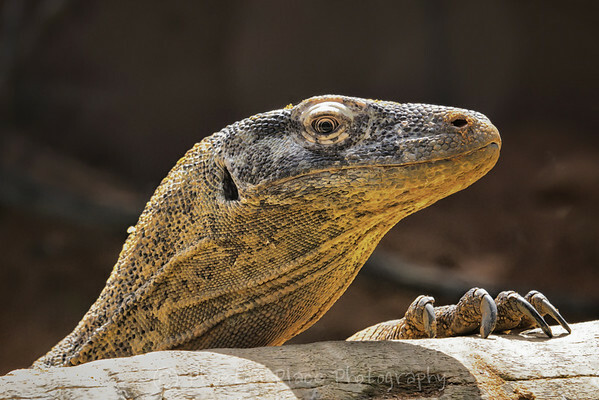 The komodo dragon and American alligator were taken at the Alligator Farm. 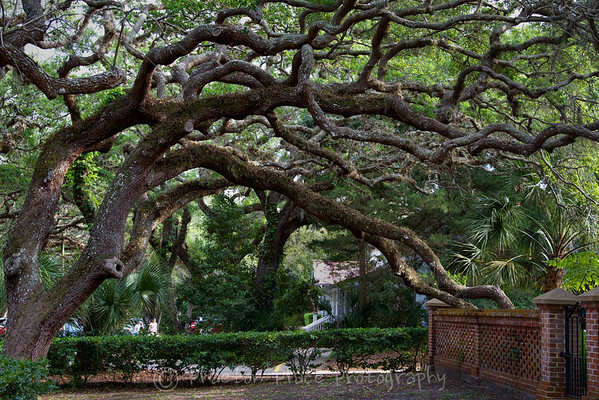 The shot of the live oaks was taken at the base of St Augustine’s lighthouse on the day we arrived in St Augustine. Time to take Teddy for his walk before bedtime. This entry was posted in Campgrounds, Georgia, Pets, Phaeton, Photography.